I can share the spreadsheet with my TAs so they can enter grades for their labs. We are all always on the same page. Google spreadsheet keeps track of all old revisions, so if any one of us makes a mistake we can always go back to see what the original grade was. It is trivially easy to create a graph of the grades and post a link to it on the class blog. The graph gets updated automatically as the grades change. However, one remaining problem was how to give each student his grades without revealing all the grades, which our university frowns upon, even if the names are not posted. The clear answer is to email each student his own grade. the 'template' sheet contains the template information for building the emails (your message). Once you have the spreadsheet built, go to 'Tools -> Scripts -> Scripts Editor and cut-and-paste the emailgrades.js script in there. Save it, then close and re-open the spreadsheet (or, run the onOpen method if you know how to do that). You should now see a new menu item on you spreadsheet called 'Class', as shown in the screenshot. 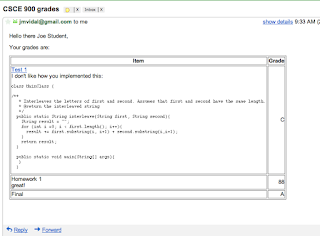 The 'Send Emails' item will send each student (row) his grades if you choose it when you have no cells selected. If you first select (light blue background box) some cells in the spreadsheet then it will only email the students in the selected rows. You can verify that the emails have been sent by going into your gmail account and checking the 'Sent Mail' folder. It can take several minutes for the emails to start appearing so be patient. The 'Preview Emails' item is mostly for debugging. It will show you a preview of two of the emails that send emails would send. The 'Show Email Quota' item tells you how many more emails you can send today. Google limits scripts to 500 emails per day to keep spammers from abusing the system. Since my classes have at most 60 students this has not been a problem for me. If you have any comments, bug reports, or feature requests please post them below. how to verify that the emails have been sent by going into gmail account? 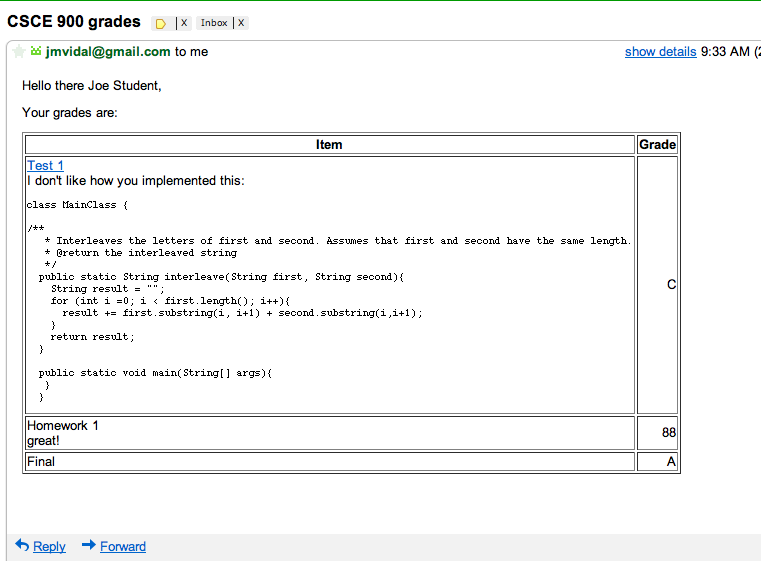 If you look at the code (emailgrades.js), there is a commented-out line that shows how to bcc: an email. In my classes I put this line back in so I get a bcc: on every email sent, so my gmail gets a copy of every email sent. i just have a question how can I change the column names ? or use more columns ?